Synthetic peptide: KRSRTRTDpSYSAGQSVEI, corresponding to C terminal amino acids 2440-2463 of Human mTOR. Our Abpromise guarantee covers the use of ab1093 in the following tested applications. WB 1/1000. Detects a band of approximately 250 kDa (predicted molecular weight: 288 kDa). ELISA 1/6000 - 1/29000. 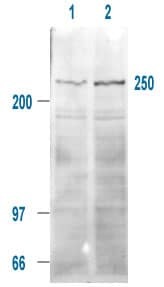 Assayed aginst 0.1 µg of the immunizing peptide and has not been tested against the endogenous protein. Rabbit polyclonal to phospho mTOR (Ser 2448) at 1/1000 on 293T cell extract shows a band at approx 250 kDa. ab1093 at 5 µg/ml staining proximal convulted tubules of the kidney. The image shows localization of the antibody as the precipitated red signal, with a hematoxylin purple nuclear counterstain. BATCH NUMBER 125112 ORDER NUMBER 94471 DESCRIPTION OF THE PROBLEM No signal at all SAMPLE WCL isolated from cultured HepG2 , HCT116, DLD1, SUV480 and HT29 cells PRIMARY ANTIBODY Dilution: 1:1000 Dilution buffer: TBS-Tween 20(0.1%) with 5% BSA incubation: overnight at 4 degrees Waching step: wash with TBS-Tween 20(0.1%) , 5min x 3 DETECTION METHOD ECL plus system POSITIVE AND NEGATIVE CONTROLS USED No, the customer didn't use both positive and negative controls. ANTIBODY STORAGE CONDITIONS It was stored at -20 degrees. SAMPLE PREPARATION Lysis buffer: CelLytic-M from SIGMA (cat# C2978) Protease inhibitors: protease inhibitor coacktai tablets from Roche (cat# 11697 498001) Loading buffer: TrisGlycine-SDS sample buffer (2x) from Invitrogen Heating sample: for 5 minutes at 95 degrees AMOUNT OF PROTEIN LOADED approximately 20ug each ELECTROPHORESIS/GEL CONDITIONS 4-12% Tris-Glycine Gel (1.0mm thick) from Invitrogen TRANSFER AND BLOCKING CONDITIONS Blocking buffer: TBS-Tween 20 (0.1%) Blocking agent: 5% non-fat dry milk incubation : for 1 hour at room temp SECONDARY ANTIBODY 2nd Ab: Anti rabbit IgG-HRP conjugated Dilution: 1:10000 Incubation: for 1 hour at room temp Wash step: TBS-Tween 20(0.1%), 5min x 3 HOW MANY TIMES HAVE YOU TRIED THE APPLICATION? 1 ADDITIONAL NOTES Would you please let me know how we should advise her about this matter?